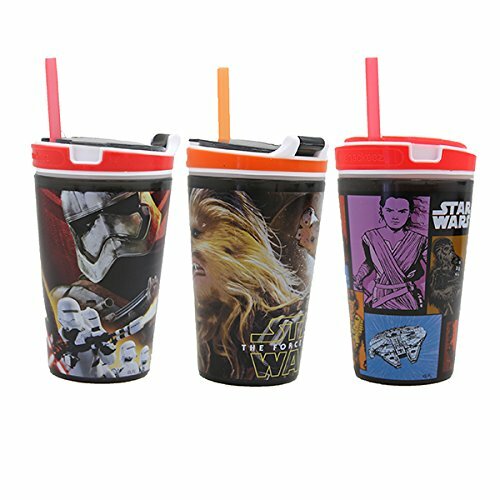 Star Wars Snackeez Jr 2-in-1 Snack and Drink Cup - As Seen On TV. No more spills with this two in one snacking system. Great for the car, on the couch, or even at parties. Hold your drink and a favorite snack all in one hand. Hinged flip-top lid snaps securely shut to keep snacks fresh. Non-slip grip. Top-rack, dishwasher-safe. BPA-Free. Note: this is random and you cannot select the design you receive. Package of three cups! If you have any questions about this product by Snackeez, contact us by completing and submitting the form below. If you are looking for a specif part number, please include it with your message.